The 12 O'Clock High TV show was a 60 minute action series on ABC about the lives Of the men with the Eighth Air Force stationed in eastern England from 1942 to the end of World War II. Their mission was to perform daytime bombing mission over Western Europe, specifically both Germany and territories occupied by German troops. Scenes including the launching of reconnaissance flights often obviously used stock footage. The plane taking off was a "P-51D" and when the scene changes, the plane in flight is a P-51D. The canopies of the two planes are radically different in appearance so you can't miss it! 12 O'Clock High won an Emmy in 1965 for "Outstanding Individual Achievements in Entertainment - Cinematographer" (William W. Spencer). That same year it was nominated for a Golden Globe Award for "Best TV Show" but the series titled, "The Rogues" took the first place Award. Fellow disappointed Nominees that year included, "The Munsters", "The Red Skelton Show", and "Wendy and Me". Robert Lansing was born "Robert Brown". He actually picked out his new show business surname from the capital city of Michigan. In addition to numerous guest-starring and recurring role on other TV shows Mr. Lansing also co-starred on the series "87th Precinct", "Kung Fu: The Legend Continues", and "Automan". He also starred on the series "The Man Who Never Was". Of course, any fan of the original Star Trek series will remember Robert as the man from far in the future named, "Mister Seven" on the episode titled, "Assignment: Earth". He had been "assigned" to Earth in the 1960s in order to keep us from killing ourselves in a nuclear war. Captain Kirk and the Enterprise were also there in the past and didn't know wheter Mister Seven was a good guy or a bad guy. When they tryed to stop Mister Seven's movements, they discovered that his technology was from far farther in the future than that of the Enterprise. That episode came very close to becoming a "spin-off" series but didn't quite make it. 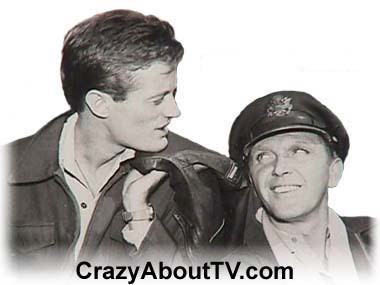 Many viewers were very disappointed when season two of the 12 O'Clock High TV show began and Robert Lansing was gone. Paul Burke's character took over as the commander of the Eighth Air Force, but many had so loved Lansing in the role that they couldn't accept Burke! 12 O'Clock High was developed by "Quinn Martin Productions". They produced many hit shows in the 1960s and 70s including "The Fugitive", "The F.B.I. ", "The Invaders", "Cannon", "The Streets of San Francisco", and "Barnaby Jones"! Twelve O'Clock High (1/26/1950) - Starring Gregory Peck. Inspiration for the 12 O'Clock High TV series. Won two oscars and was nominated for two more! Thank you for visiting our 12 O'Clock High TV Series Cast page!